Now that school is out, kids throughout the state have lots of free time until classes resume in August. This provides a golden opportunity for parents and grandparents to nurture in children what the famous author and environmentalist Rachel Carson called a sense of wonder – a deep, abiding appreciation of the plants and animals with which we share the world. When I was growing up, I spent the majority of the summer outdoors fishing, swimming, playing baseball and roaming around the neighborhood and nearby countryside with my brother and friends just seeing what we could find. Looking back, I realize that my friends and I learned more about plants, insects, birds, reptiles and amphibians during summer than at any other time of the year. Remarkably this was done without any adult supervision, equipment such as binoculars and no more references than a few pocket-sized Golden Nature Guides. The world that I grew up in is far different than today. Many parents are now afraid to let their children outdoors without supervision. Most children grow up in homes surrounded by postage stamp-sized yards and spend little time outdoors. Because of these and many other factors, too few children feel a kinship with the land and the plants and animals that live there. As a result, they are more apt to be able to identify a Burger King sign than a white oak tree. Indeed most of children are growing up with what has been dubbed Nature Deficit Disorder. Educators, conservationists and many others are working on this problem. Although educational initiatives such as Project WILD have made strides to alleviate this situation, to me it has become abundantly clear that much more needs to be done. If you are concerned that your children and grandchildren are growing up disconnected from the natural world, there is no better time to do something about it than this summer. It won’t take a lot of time and it can take place in your own yard. Begin by taking short but regular walks around the yard. These brief walks should take part at all times of the day. Treat each as an adventure. During these adventures, share your enthusiasm for nature. Teach youngsters they need to use their senses of hearing, touch, smell and sight when exploring nature. Have them explore the natural world. Visit different habitats (e.g., a lawn, shrubs, trees, flower gardens) and encourage them to find the different types of plants and animals living there. Once you pause long enough to look closely, you and your child will soon discover that an amazing array of life lives in your yard. In addition to dozens of different kinds of birds, it would not be uncommon to find scores of butterflies, well more than 100 species of moths and hundreds of other insects. Gardens are great places to look for wildlife. If you and your young adventurer sit and watch a small flower garden for a few minutes you will be amazed at the number of insects that come and go. Here you can observe hunters and the hunted as well as tiny jewel-like eggs of butterflies and moths. You will discover insects that are beautiful and others so bizarre they would be right at home in a horror movie. Once you and your companion begin looking for your backyard neighbors, a previously unseen world will almost magically come into focus. Bird calls that went unheard suddenly seem to fill the air. You will notice the fragile beauty of leaves and violet blossoms. As you might expect, the best backyards are on the large side, are not liberally doused with herbicides and pesticides, and provide wildlife with a variety and abundance of food, water and cover. However, even the smallest of yards can be used to introduce youngsters to the natural world. If any of these components – food, water, cover – are lacking or in short supply, involve children in projects to address these needs. Kids enjoy putting up and maintaining nest boxes, bird feeders and birdbaths. You might even consider sowing the seeds of easy to grow flowers that benefit wildlife, such as zinnias and cosmos. Look for cocoons and chrysalises. Compare the different shapes of leaves. When night falls, try to catch fireflies and see how many different kinds of moths and other insects are attracted to your home’s outside lights. While no special equipment is needed to fuel an interest in the natural world, a few devices can enhance your experiences. 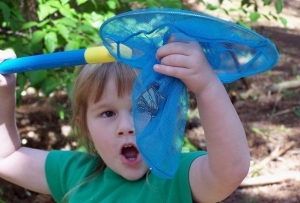 A butterfly net allows children to closely study butterflies and insects before releasing them. A point-and-shoot digital camera equipped with a macro feature permits you and your fellow adventurers to study the intricate details of flowers, leaves and insects at your leisure. If you are hesitant to embark on a journey of discovery in your backyard simply because you can’t tell a loblolly pine from a sumac, or a Carolina wren from a chipping sparrow, cast your fears aside. It is not important that you know the names of everything you find – nobody does. The important thing is that your child sees and feels your joy and enthusiasm for whatever you discover. If he or she shows a special interest in wanting to identify plants, birds or flowers, there is a wide variety of excellent field guides you can buy or borrow from the library. Or, if you prefer, you can go online and find a wealth of websites dedicated to the identification of just about anything that grows, flies, swims, walks or crawls. Don’t let these adventures end when the school bell rings this August. Make them one of the regular ways you spend quality of time with your children and grandchildren. Although there is no better time to begin a journey of discovery, each season offers its own special discoveries. While many of us would like today’s children to have the same opportunities to enjoy nature that we did, it just isn’t going to happen. However, using a little bit of ingenuity, we can instill in our young people that sense of wonder that is so woefully lacking in so many. Parents are constantly striving to provide their children with the tools to live productive, enjoyable lives. From my way of thinking, one of the tools they will also need is a sense of wonder for the natural world. This often overlooked facet adds immeasurably to their quality of life. Begin nurturing a sense of wonder in your child this summer. It will be one of the most important things you do. Terry Johnson is a former Nongame program manager with the Wildlife Resources Division, a backyard wildlife expert, and executive director of TERN, the friends group of the Nongame Conservation Section. (Permission is required to reprint this column. Contact rick.lavender@dnr.ga.gov.) Learn more about TERN, The Environmental Resources Network at http://tern.homestead.com. Now that school is out, kids throughout the state have lots of free time until classes resume in August. Have you have noticed that pumpkins mean different things to different people? New themes and new experiences await this year's summer campers! Come explore all our camps have to offer.